Though he had used it before, Degas turned to pastel in earnest at about the time of this work, and it then became his favorite medium. This is one of the first examples in which the pastel was added over a monotype, a printing technique he had only recently learned. Made by incizing or smudging away greasy ink on a metal plate and then printing through a press, the monotype method can actually produce two images, the first much darker than the second. Thus there is a variant to this work with dancers added to both the background and foreground. This pastel shows a primary ballerina making her exit bows, while her 'promoter' waits in the background among the sets, together with the other dancers. The severe downward angle suggests that the viewpoint is from one of the higher boxes. The composition is notable in that a large expanse of empty stage is left, providing a foil to the figure of the ballerina, brightly lit from below by the footlights. The background sets are only roughly sketched with swirls of pastel color, again to avoid distracting from the center stage. 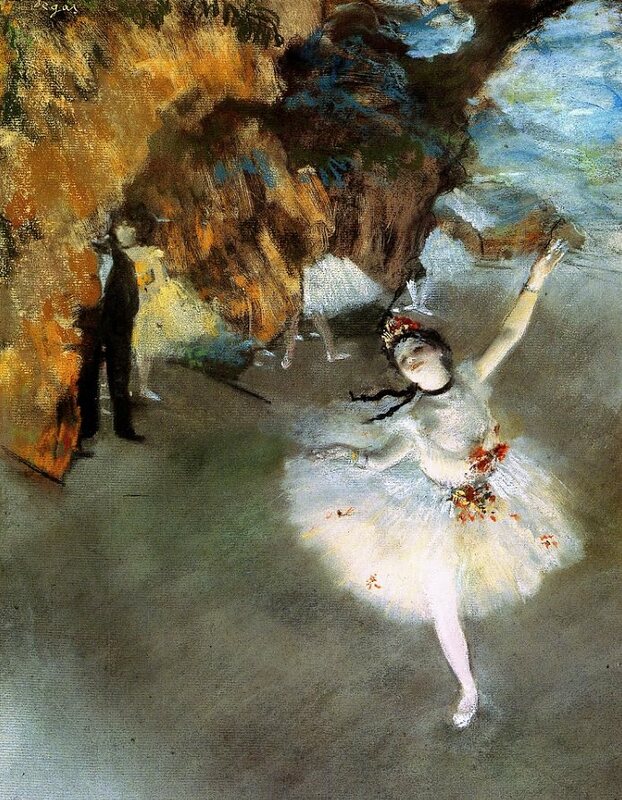 At the Third Impressionist Exhibition of 1877 Degas showed another pastel on the subject of ballet together with this one. Georges Riviere, in his review in L'Impressioniste, remarked to his readers that 'After having seen these pastels, you will never have to go to the Opera again'.